Answers / Cheats for 94% Something You Celebrate. If you’re stuck, you can get the answers on this site. 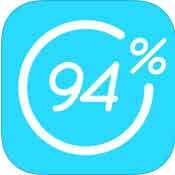 94% is a game app developed by SCIMOB, the developer of other 94 games (94 seconds, etc). 94% is available on iTunes, Google Play and Amazon App Store.